A beautiful DIY terrarium evokes our memories of a lost paradise: lush jungles, moist tropical air, and rain forest by the ocean. How to choose the right type of terrarium plants. 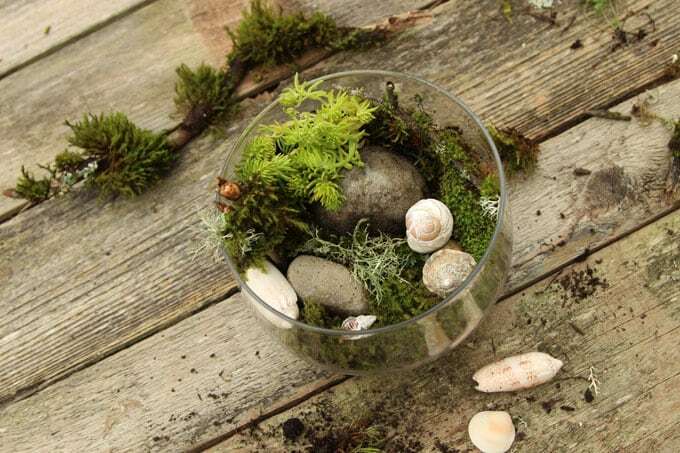 How to make a terrarium that is beautiful and easy to maintain. Helpful tips on terrarium care and maintenance. 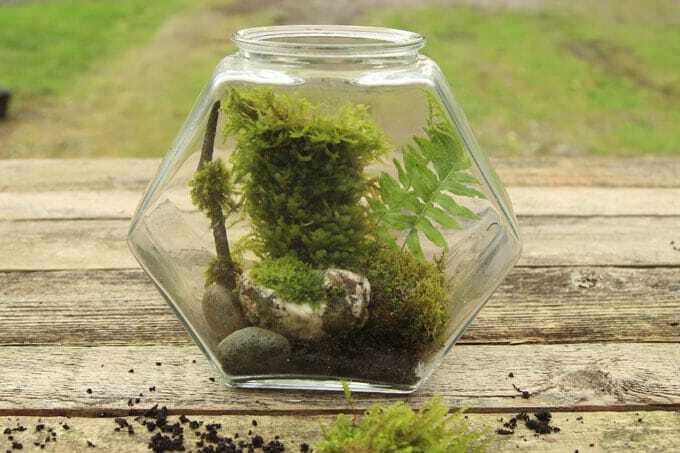 Although there are terrarium kits designed to make more professional looking and longer lasting terrariums, you don’t need special supplies to create a little living paradise in a glass jar. 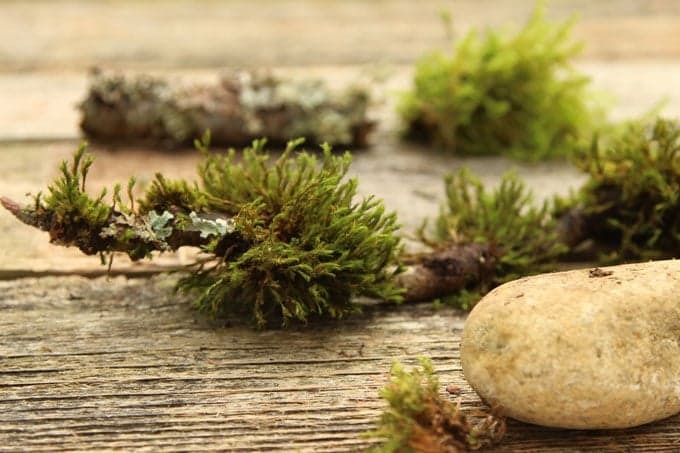 A trip to a yard sale and a walk in the woods will give you all the treasures needed to make your own magical terrarium. There are two types of terrariums: open and closed, which will determine the choices of your terrarium plants. Closed terrariums should be kept mostly in the shade. 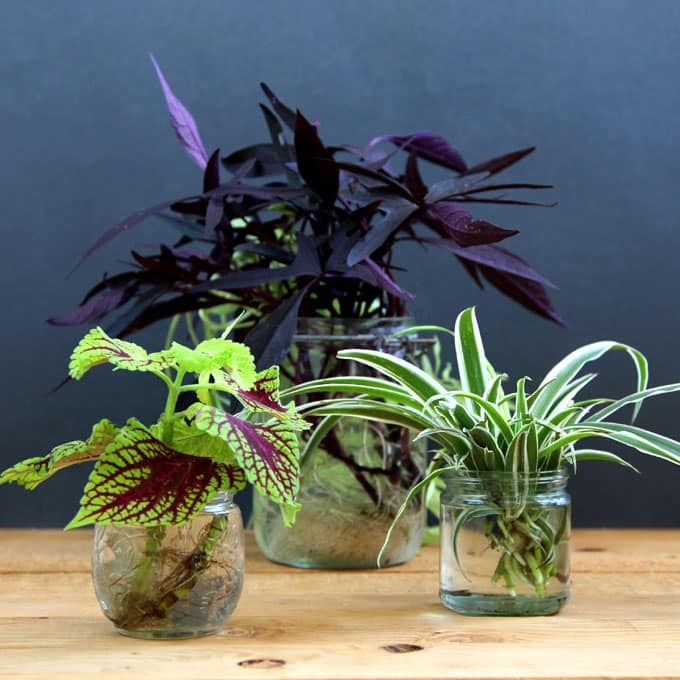 Best terrarium plants for a closed terrarium need to be compact, and humidity-loving. 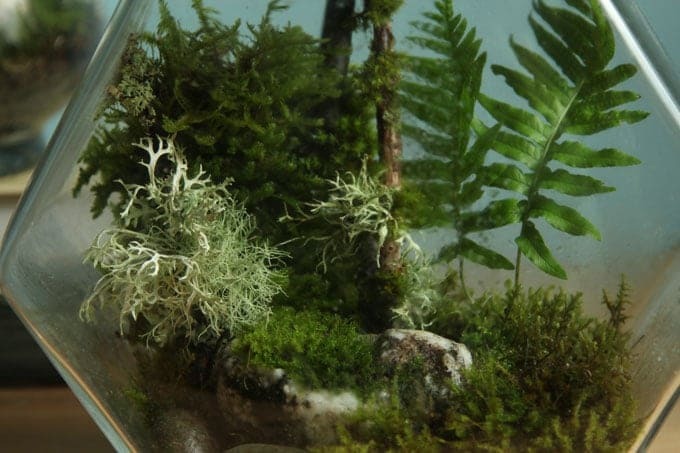 Moss, ferns, and most small plants in the house plant section of a nursery are from the shaded forest floor habitat, will work great in a closed terrarium. Because of little moisture loss, the closed terrarium can stay alive and healthy for months with almost no maintenance. I made my closed terrarium ( the one in the photo above), and never had to open the jar in 5 months! Plants such as succulents would not be suitable for a closed terrarium, because they like low moisture in the air. 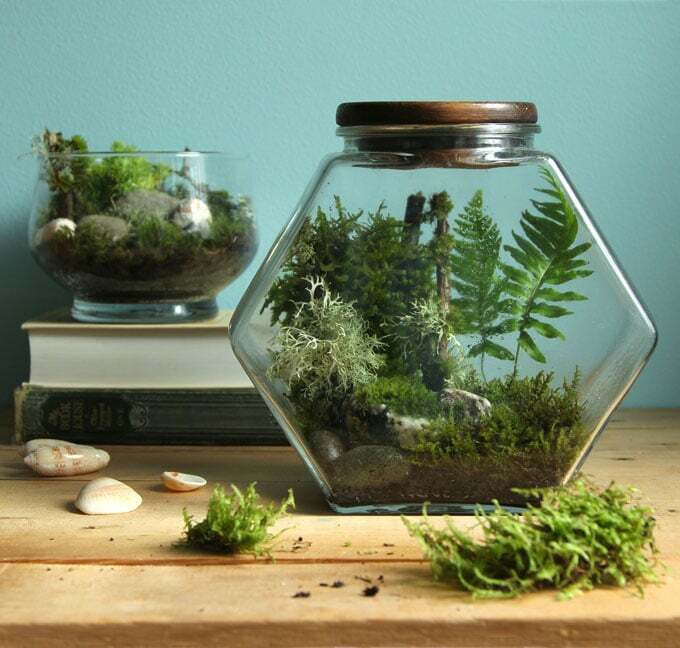 Open terrariums can be kept in the sun or shade. They are more like glass planters than a traditional “terrarium”. In addition to all the plants used in closed terrariums, you can plant orchid, any small indoor plants, etc. You can also make succulent terrariums using small succulents and air plants, which love a dry environment. 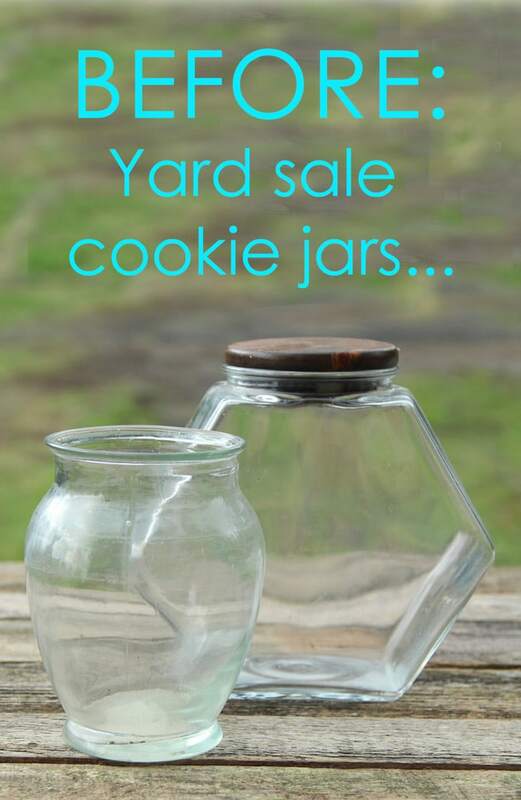 large glass jars or vases: often yards sales or thrift stores will have vases or (affiliate link) glass cookie jars with lids like these. planting medium: gravel or small pebbles, clean soil such as potting soil, a layer of activated charcoal or horticultural charcoal on the bottom of a terrarium will help absorb impurities. 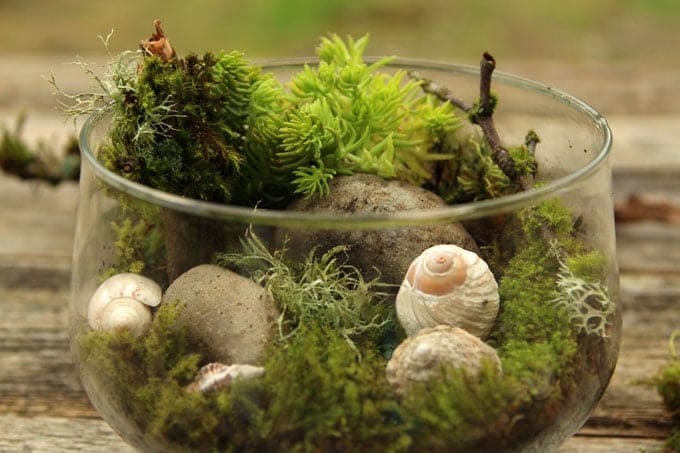 It is not required for open terrariums such as succulent terrariums, but highly recommended for closed terrariums..
treasures found on a nature walk, such as moss, ferns, seashells, branches, rocks, etc. 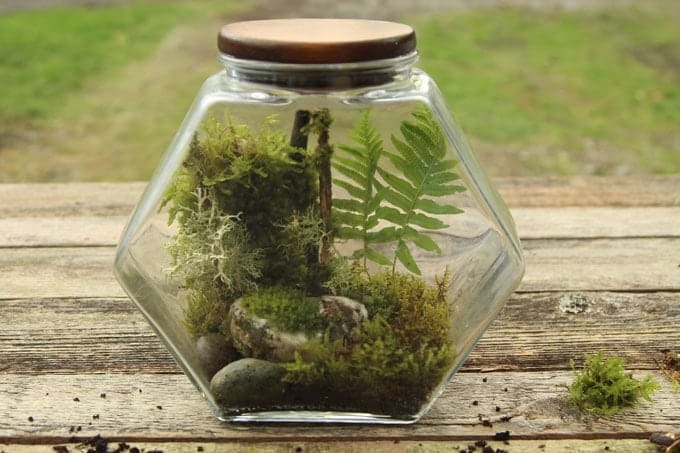 You can also buy preserved moss like this. 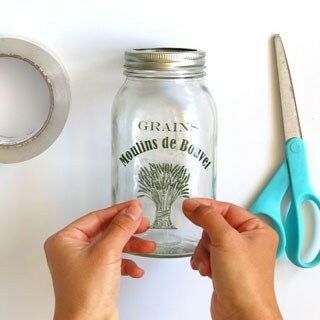 Let’s first make a closed terrarium first using a large cookie jar. 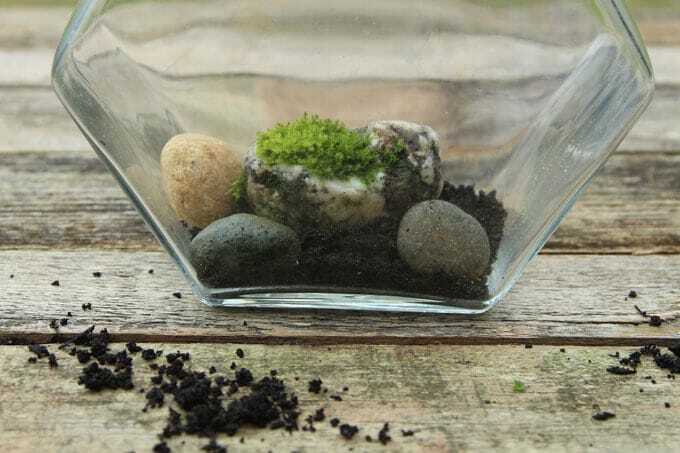 Put a 1″ layer of 50% pea gravel or fine rocks mixed with 50% horticultural charcoal ( easier to find than activated charcoal ) at the bottom of the DIY terrarium. This will keep bacteria and mold from developing in the closed terrarium. Next, add some moist soil. The soil layer does not need to be that thick. 2″ to 3″ is enough for most plants. 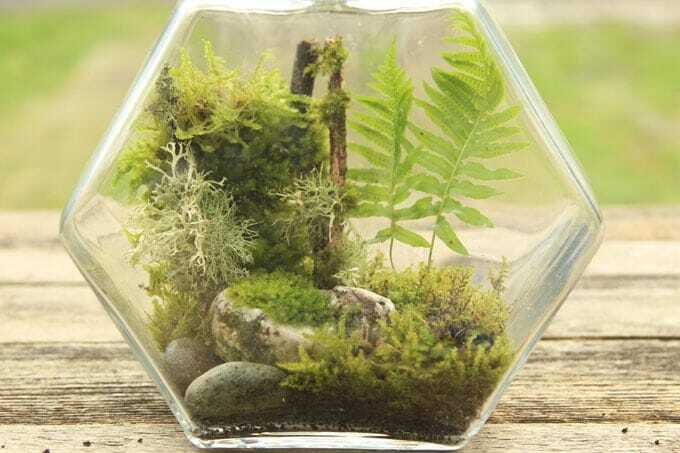 Small plants from the shaded forest floor are great for terrariums, such as tiny ferns , moss, and most small house plants. Related Article: If you love indoor gardens, another easy way to grow beautiful indoor plants is to use just glass bottles and water. Tutorial on how to grow beautiful indoor plants in glass bottles and water. Vertical elements, such as twigs and barks, can create the look of a mini forest. Some even have moss on them, so pretty! Move things around until everything looks balanced in the terrarium. It’s like creating a painting, or a bouquet. 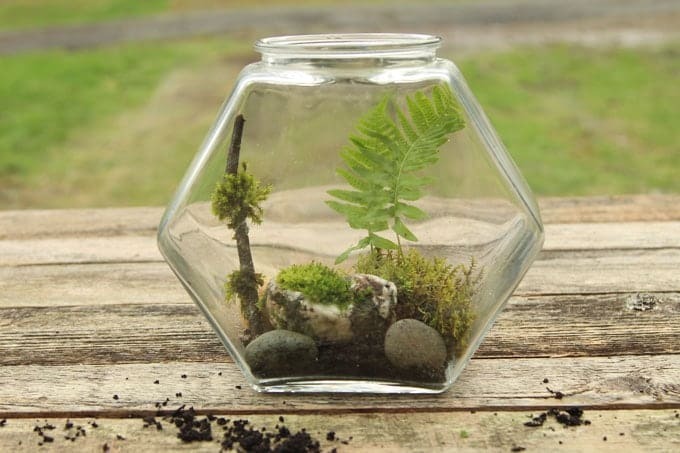 Step back and look at everything, shift things around until you are happy with how your DIY terrarium looks! Give everything a gentle mist, close the jar, and enjoy your little piece of tropical jungle paradise! 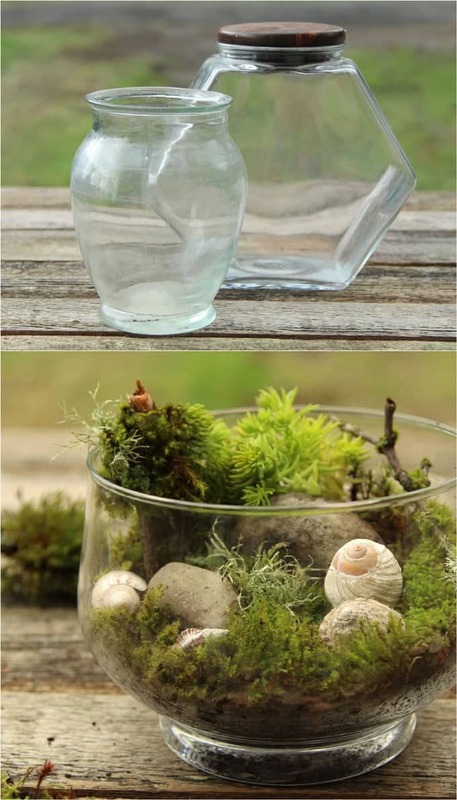 How to make a terrarium that is open without lid. 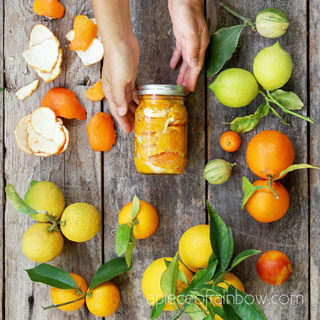 Follow Steps 1-3 for the closed terrarium DIY. The main difference is that we have a wider choice of plants. Just try to keep plants with similar moisture requirements in the same terrarium. For example, succulents love to be kept more dry, and ferns love to be watered often. I added some Sedum plants and a few seashells for different colors and textures. The closed terrarium requires almost no maintenance if it is set up right and placed in a bright location without direct sun. The open terrarium needs to be misted once every couple of days for fern and moss type plants. A succulent terrarium just need watering about once every 1-2 weeks. It can take some direct sun. Do not let water puddle at the bottom for more than 1 day. 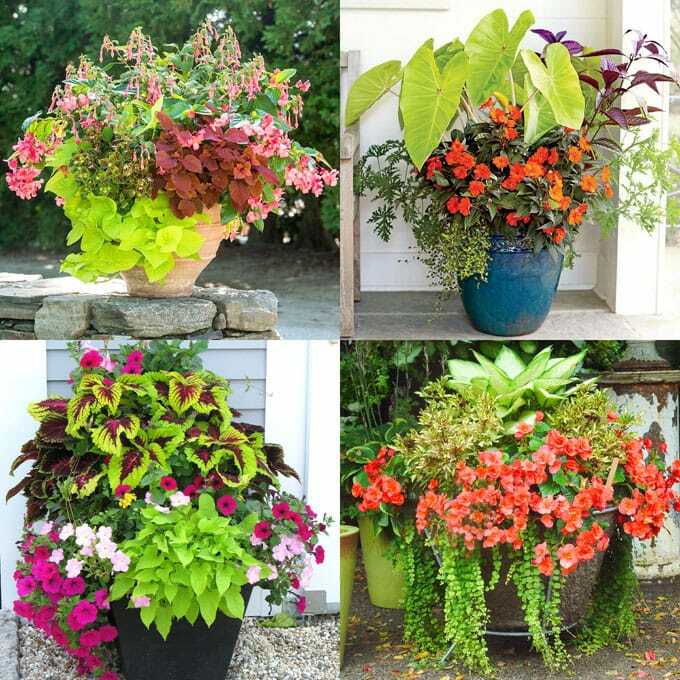 You may also love: 16 colorful shade garden pots with plant list for each.16 colorful shade garden pots with plant list for each. 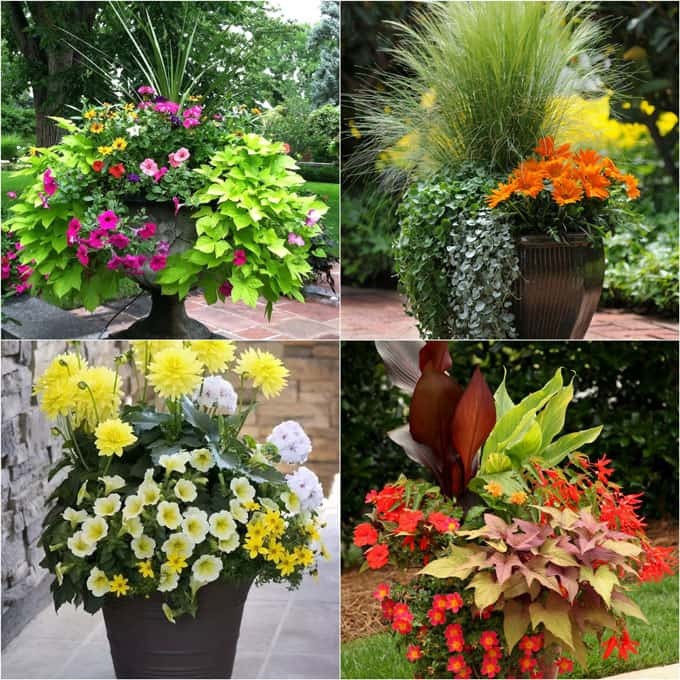 And 24 beautiful container garden designs for sunny areas. It turned out so pretty! I’m loving every single on of them. The first one is my favourite! OoOoo So pretty! You did a great job on this! This is so cool!! Everything turned out so great!! This is super adorable! 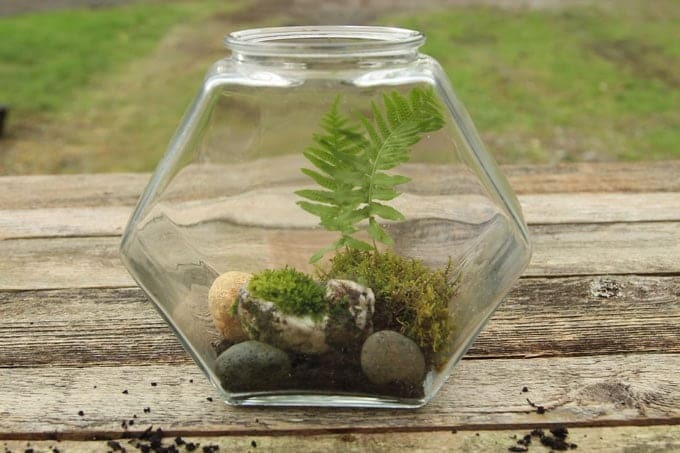 I think a terrarium would be perfect for a new college grad who may be moving soon as a house warming gift! Great tutorial to explain it all! Wait, they can actually stay alive for that long in a sealed jar? That’s wild! 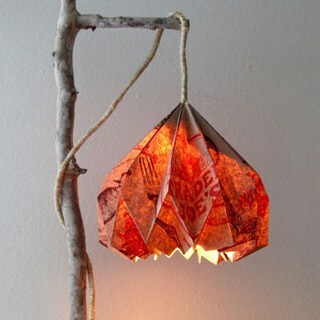 I’m going to make one this weekend! This is the cutest idea!! This would actually be so cute in my living room! Can’t wait to make one!! Gads I hate to be one of those people that says ” That’s EXACTLY what I was going to say you should make! !” But I am – well a Fairie Garden was my second thought – LOL! Yours turned out beautiful!! So gorgeous! Love this DIY, you did a great job! Oh i didn’t know you can have a closed one! I hate bugs so I never like to plant anything in the house, but that i can do! Very Pretty! You are an inspiration! I made one years ago. It had a small opening but no lid. I use a piece of plastic wrap and a rubber band to seal it. This kept in the moisture so I hardly ever had water it. Before adding soil, a bit of granulated charcoal and a layer of small pebbles on the bottom will prevent odors and ensure good drainage, especially if you are making a closed system.